Justin Timberlake just surprised Selfie Kid on "Ellen"
The 2018 Super Bowl left a lot of us talking. Not only was it a winning night for the Philadelphia Eagles, but it was a big night for Ryan McKenna, who has since been dubbed “Selfie Kid.” During the end of Justin Timberlake’s performance, the singer ran up to the audience and sang alongside them. McKenna quickly grabbed a selfie with Timberlake, and then proceeded to fumble with his phone as a world-famous pop icon sang beside him on live TV. As these things do, the moment quickly became one of the biggest Super Bowl memes this year. 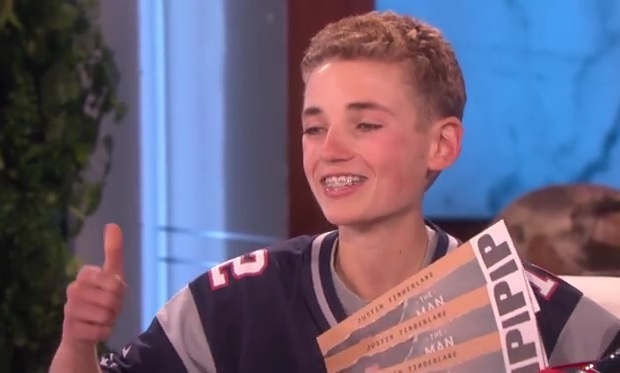 The 13-year-old made a few television appearances after the big game, but the most notable had to be The Ellen DeGeneres Show. Appearing on Friday, February 9th’s episode, he chatted with the host about the whole crazy experience. According to McKenna, he has a slow iPhone, and it shut off right at the exact moment he was trying to capture the incredible moment (hence, the fumbling). At which point JT called into the show. The call almost had McKenna in tears (we get it, buddy). Timberlake even invited the teen and his family to an upcoming show so that he can meet his ’90s-era doppelgänger in person. Nobody expected Selfie Kid to make Timberlake’s performance even more spectacular, but sometimes it’s the most unexpected moments in life that we remember forever. Thanks, Ryan. Also, thanks Apple. This never would have happened without your iPhone 6 malfunctioning at the worst possible moment.